Cocktail bars provide the perfect space to unwind after a long week. 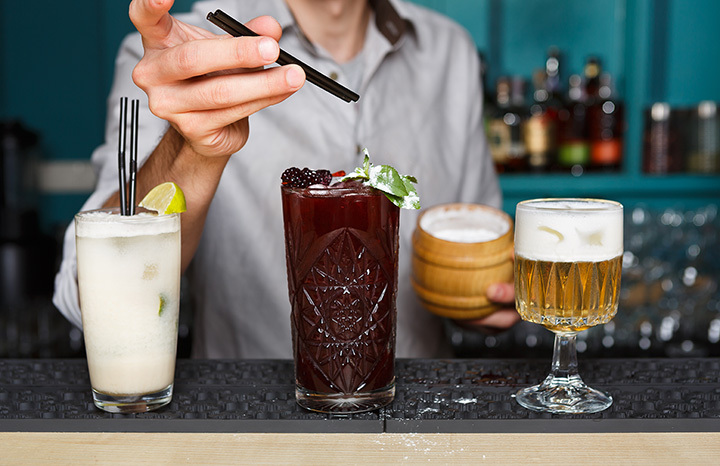 Whether you’re craving a cosmopolitan, a Bloody Mary, or an Old Fashioned, there’s something to suit your style and taste at the impressive cocktail bars of Virginia. Let the expert mixologists do the work at the 10 best cocktail bars in the state! The Rogue Gentlemen is a trendy, hip cocktail bar serving 16 original cocktails “paired with our incredibly creative cocktail menus.” The food is delicious, atmosphere cozy, and cocktails to die for. Tavola serves rustic Italian food and craft cocktails in Charlottesville, Virginia. Recently expanded, the renovated location includes a crack cocktail lounge and cicchetti bar. Stop by before dinner to enjoy cocktails and antipasti with friends. Baba Bar is all about attitude. Enjoy Happy Hour every Monday-Friday from 4 p.m. to 7 p.m., and enjoy the mixology stylings of Esteban Cordonez every night from 4 p.m. until close. The Mona Lounge and Cigar Bar offers a more old-fashioned lounging experience. Puff on a fine cigar, enjoy a nice drink, and reminisce with old friends before heading over for a fine dinner. Francis in Sperryville, Virginia, aims to become “the neighborhood bar you’ve always wished you’d had.” They are relatively new, having opened only in May 2017, but have already distinguished themselves with their inviting atmosphere and delicious, unique cocktail selections. Morning goodness photo shoot of a delicious fall creation...this well balanced beauty is yet to be named but it has Vodka, Luxardo, St. Germain, housemade Grape Shrub, lemon and Lavender Bitters from @dcembitterment its crisp and perfect for you Cosmo drinkers that want to get a little wild this holiday season. We are open til 9pm tonight and closed tomorrow regular hours on Friday 5-10pm. thanks @luxardousa - @stgermaindrinks drink recipe by @wildroots_apothecary. Food.Bar.Food brings global comfort food to Harrisonburg, Virginia. They offer brand new cocktail specials every week on their bar cocktail menu, as well as their brunch cocktail menu. The Pompei Lounge has two floors of live music and “an open-air rooftop terrace…overlooking the city” to go along with their excellent food and drinks. Whether you’re looking for a night out with friends or a fun date option, the Pompei Lounge shouldn’t be overlooked. Bar PX in Alexandria, Virginia asks visitors to indulge their 1950 cocktail bar fantasies by wearing dresses and jackets to help set the mood. Consider renting out the Blue Room, an intimate setting with couches and candlelight, perfect for group events. Saint Germain in Norfolk, Virginia, is a vintage and craft cocktail bar that cannot be overlooked. Everything they do radiates style, from the elk head hanging from the wall to the chandeliers imprisoned in bird cages. But most importantly, their food and cocktails are delicious, which makes stopping by a treat. Trummers on Main in Clifton, Virginia, offers a wide variety of dining options, including in their bar and lounge, dining room, private dining, and wine bar. Relax in their cocktail lounge from 4:30 p.m. until close and enjoy a Trummer’s original drink and a selection and food from their full menu.